Every year, from July to November, whales arrive along the southern coast of South African shores. The gentle giants travel thousands of miles to mate and calve in the safe and warm waters of protected bays. Its steep cliffs and high vantage points make it perfect for spying the enormous creatures. The heart of the Whale Coast is Hermanus, renowned as the best whale watching area in the country. 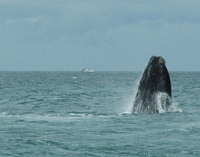 Here, southern right whales inhabit Walker Bay, often within 33 feet (10m) of the shore. According to the Word Wildlife Fund, Walker Bay is one of the top 12 whale viewing destinations in the world. The Whale Coast stretches from the Western Cape, up the east coast, including spots along the Garden Route such as Mossel Bay, Knysna, Plettenberg Bay, and the Tsitsikamma National Park coastline. The De Hoop Nature and Marine Reserve is also popular during season for its Whale Trail, a five-day hiking excursion that offers fantastic whale viewing opportunities along its coastal stretch. Companies offer boat trips too, allowing you incredible close up experiences with these fantastic beasts.